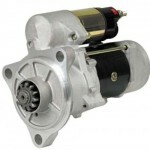 A car starter is an electric motor used to rotate an internal combustion engine to initiate the engine’s operation under its own power by sucking fuel and air into the cylinders. Starters are only turned on when the key is turned to the start position. An electrical signal is sent from the microchip in the key to the car computer, through the alarm and the neutral safety switch, to the solenoid engaging the starter. The starter turns the flywheel which turns the engine. Car starters are located low between the engine and transmission so the starter gears can turn the flywheel that is attached to the back of the engine. A starter needs a high electrical current powered by the car battery to start the rotation of the engine. Advanced Auto Repair offers car starter replacement and repair service in North Attleborough MA. Our experienced Automotive repair technician check the starter and other electrical system components before replacing the starter to ensure you car is running right.